This past Saturday and Sunday weren’t quite as busy as the previous weekend, but I did accept another invitation for a New Year’s celebration hosted by the Kumamoto Kenjin Kai in Little Tokyo. Whenever any group holds an event in J-Town, I never miss it because I’m always looking for an excuse to come into Little Tokyo. The luncheon was held at the Miyako Hotel, which is in the middle of J-Town. I was pleasantly surprised that the head of the Kumamoto club was waiting for me to show up. I had figured that I would sign in and go to the table assigned for me and my wife. Since it was the Miyako, the luncheon was strictly Japanese. That would include sashimi and all the trimmings that go with it. Some of you may recall that in a recent column I wrote about the health benefits of daikon. Well, surprise, surprise. One of the door prizes they distributed at the luncheon was daikon. Not an ordinary daikon you might buy at a Japanese supermarket but a real large one, about a foot long. Since you can’t find one so large in a Japanese supermarket, I assumed one of the Kumamoto club members is a farmer and he grew it on his farm. Guess I’ll be able to enjoy the “good for your health” vegetable for a week. Yes. My wife and I both also won the raffle drawing after the luncheon. Some of you may remember that my wife and I won raffle prizes after the Terminal Islanders’ luncheon the previous week. I’m doing here. Well, I didn’t see anyone giving me a nasty look when the door prizes were delivered to our table. Of course, I wasn’t looking for any dirty looks. Heh, heh. Maybe I shouldn’t even mention this tidbit. I may not get another invitation in the future. Some of you may recall that I mentioned the name of Patti Hirahara when I wrote about ABC7 newscaster David Ono interviewing me for a TV special he is producing for release in May on the Heart Mountain Relocation Center. “Thank you so much for mentioning our meeting in your column and it was good to have a chance to talk with you that day. “I have a news item that might be of interest to your readers since it relates to Heart Mountain and the 1,018 people that left the Yakima Valley in Washington State and went to the Portland Assembly Center and then to Heart Mountain. “The first Yakima Valley Reunion was held in Yakima in 1973, 28 years after the war, and the Yakima Valley Japanese Community in conjunction with the Yakima Valley Museum will be hold a second reunion, 40 years later, this coming Memorial Day weekend on May 25-28 in Yakima. The reunion is open to all descendants of families who lived in the valley before and after the war. “Currently, the museum is showing the 2,000-square-foot award-winning exhibit ‘Land of Joy and Sorrow: Japanese Pioneers of the Yakima Valley.’ The exhibit opened in October of 2010 and continues to be a popular ongoing attraction. The initial opening reception had the largest attendance for any exhibit at the Yakima Valley Museum in recent memory. “The Yakima Valley Japanese community was devastated due to its need to relocate and being interned during World War II in Heart Mountain, with only 10 percent of the residents returning in 1945. Thanks for the information, Patti. I’m sure that a lot of Japanese Americans who were incarcerated in relocation camps but never returned to their original homes would like to view the Yakima display after all these years. “A little note on Ehren Watada, who you belittled during his arduous battle with the U.S. Army. He along with his brother are owners of two very successful restaurants in Las Vegas called Bachi Burgers. They also plan to open a restaurant in West Los Angeles sometime this year. “The fact that the Army dismissed the case against him and gave him a discharge speaks volumes of his character to withstand criticism from people like you. I think you owe him an apology. History will show that the Iraq War was illegal. Well, I guess I’ll have to go through my past columns to see what the reader is writing about because I don’t recall touching on the subject he mentions in his letter. Will make my comments (and apology) if what he writes about is accurate. In the meanwhile, thanks for bringing up the issue (if there is one). Okay, let me move on to my favorite subject. What else but Las Vegas? With fewer than 12 hours to go to meet their 11:59 p.m. Friday deadline, construction workers at the Nobu Hotel and Restaurant had their work cut out for them. The first hotel in Las Vegas to carry the name of the renowned Japanese chef is scheduled to open Feb. 4. General Manager Gigi Vega is confident all will go smoothly. At the 325-seat Nobu Restaurant, a sushi bar will greet people and a large circular table with seating for 16 to 20 people will sit in front of two open doors and passersby will be able to see the chefs in action. “Chef Nobu is very proud of the skills behind the food he is serving, so he wanted it open,” Vega said. Two teppan-yaki grilling tables, the first to be offered at a Nobu Restaurant in the United States, will have a seating for about eight. The 181-room Nobu Hotel will take over Caesar’s former Centurian Tower, which dates back to 1970 but was gutted and rebuilt for the new project. The former Cleopatria Way in now Nobu Way. Food from Nobu Restaurant will be available to hotel guests 24 hours day and among the options will be breakfast. “Nobu has never done breakfast before, so he had to create a menu from scratch,” Vega said. Ten days before opening, there is still much work to be done. Furniture for the hotel yet to be delivered. Television and audio hookups are still being tested, as well as electrical outlets, plumbing and carpets are still being installed. Well, maybe on my next trip to Vegas, I’ll ask my old friend Rosie if she and her sister might want to try Nobu’s breakfast. Rosie and I, along with my wife, always enjoy breakfast at The Cal when we stay there. Their buffet breakfast is tough to beat both in quality and price and one thing for sure, I don’t think Nobu’s breakfast can match the price at The Cal. Everyone knows I’m a cheapskate and price is just as important as taste. People who know veteran Nisei journalist Harry Honda are aware of his sense of humor. From time to time he sends me laughers, although I don’t always use them. • A penny saved is a government oversight. • The older you get, the tougher it is to lose weight because by then your body and your fat have gotten to be really good friends. • The easiest way to find something lost around the house is to buy a replacement. • He who hesitates is probably right. • Did you ever notice the Roman numerals for 40 are XL? • The sole purpose of a child’s middle name is so he can tell when he’s really in trouble. • Did you ever notice when you put the words “the” and “IRS” together, they spell “theirs”? • Aging: Eventually you will reach a point when you stop lying about your age and start bragging about it. • Some people to try to turn back their odometers. Not me. I want people to know why I look this way. I traveled a long ways and some of the roads weren’t paved. • When you are dissatisfied and would like to go back to your youth, think of algebra. • One of the many things no one tells you about aging is that it is such a nice change from being young. • Ah, being young is beautiful but being old is comfortable. • Lord, keep your arm around my shoulder and your hand over my mouth. Amen. Your sense of humor reminds me about those days when your office was in the old hotel across the street from the Sugar Bowl Coffee Shop on San Pedro Street. When you saw those of us from The Rafu, Shin Nichi Bei and Kashu Mainichi go in to have our daily coffee when we put our papers “to bed,” you’d come down and crack your laughers. 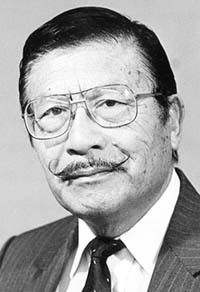 In mentioning Harry Honda and his sense of humor, I should add that former Nisei Week Queen Em Yamada tickles my funny bone from time to time. • Kelly, age 6: This is a picture of an octopus. It has eight testicles. • Jerry, age 6: Oysters’ balls are called pearls. • Mike, age 7: If you are surrounded by ocean, you are an island. If you don’t have an ocean around you, you are incontinent. • Billy, age 6: My uncle goes out in his boat with two other men and a woman and comes back with crabs. • Helen, age 6: The ocean is made up of water and fish. Why the fish don’t drown I don’t know. • James, age 7: My dad was a sailor on the ocean. He knows all about the ocean. What he doesn’t know is why he quit being a sailor and married my mom. Okay, so you think you know the Japanese language. I think I do from time to time. But, I guess I discovered my language knowledge wasn’t what I though it was. How many of you know what the Japanese word, “shimatta” means? I’ll wait for anyone’s reply. Well, they’re getting ready for the election in Gardena. I mentioned that Mayor Paul Tanaka isn’t seeking re-election as the top man in the City of Gardena, but posters for others in the City Council race is popping up all over the city. Two candidates for seats on the City Council are Nisei, but I won’t mention their names. Oh, by the way. Even though Tanaka announced that he isn’t vying for the mayor’s seat, his name will be on the ballot, which means he could win re-election even though he’s quitting. That’s because before he decided not to run, he filed for re-election. So what happens if all the Japanese Americans cast ballots for him and he gets the most votes? I suppose he’ll have to announce that he’s not going to take the seat even if he wins the election, which means the person with the second most votes will be given the title. It will be quite confusing, I would think. As a follow up, the Rafu reported recently that Paul Tanaka announced that he would serve if re-elected.